Annie was a puppy mill dog. The English Setter lived in a cage so tiny that she could hardly move. Animal wastes fell through the wire floors of the cages above her, causing her coat to take on a yellow cast. She had little human interaction — only what was necessary to keep her alive and bearing litter after litter of pups to be sold in pet stores. Read Annie’s story in Lindsey’s words. Then one day, she and other dogs at the puppy mill were rescued. Muscatine Humane Society in Muscatine, IA, took her in. There, at three years old, the dog at last had enough room to learn to walk. Meanwhile, Lindsey Rives and her boyfriend, Kris, were ready to add a dog to their family. 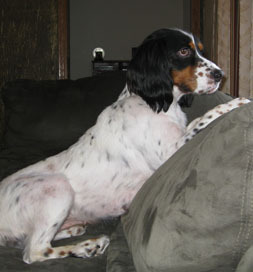 Kris’s family had a wonderful English Setter named Jessie, so the couple decided they would like an English Setter, too. “We knew we wanted to adopt and so we started looking regularly on Petfinder,” Lindsey says. They saw the rescued English Setter, now named Annie, on Muscatine Humane Society’s Petfinder pet list and decided to make the 45-minute drive from their home in East Moline, IL, to meet the pooch. As a staff person took Annie and the couple to a play area to get acquainted, he related the dog’s story. The good days are adding up for Annie, replacing the memories of those early years with happy times. Life has become beautiful.